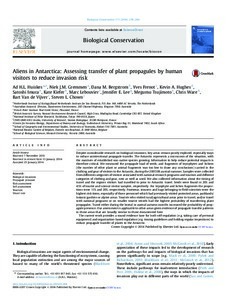 Despite considerable research on biological invasions, key areas remain poorly explored, especially ways to reduce unintentional propagule transfer. The Antarctic represents a microcosm of the situation, with the numbers of established non-native species growing. Information to help reduce potential impacts is therefore critical. We measured the propagule load of seeds, and fragments of bryophytes and lichens (the number of other plant or animal fragments was too low to draw any conclusions) carried in the clothing and gear of visitors to the Antarctic, during the 2007/08 austral summer. Samples were collected from different categories of visitors associated with national research programs and tourism and different categories of clothing and gear, new as well as used. We also collected information about the timing of travel and the regions visitors had travelled to prior to Antarctic travel. Seeds were found in 20% and 45% of tourist and science visitor samples, respectively. For bryophyte and lichen fragments the proportions were 11% and 20%, respectively. Footwear, trousers and bags belonging to field scientists were the highest risk items, especially of those personnel which had previously visited protected areas, parklands/botanic gardens or alpine areas. Tourists who visited rural/agricultural areas prior to travel, and/or travel with national programs or on smaller tourist vessels had the highest probability of transferring plant propagules. Travel either during the boreal or austral autumn months increased the probability of propagule presence. Our assessment is applicable to other areas given evidence of propagule transfer patterns in those areas that are broadly similar to those documented here. The current work provides a sound evidence base for both self-regulation (e.g. taking care of personal equipment) and organization-based regulation (e.g. issuing guidelines and holding regular inspections) to reduce propagule transfer of plants to the Antarctic.